Hawaii really is unique. Those islands way out in the middle of the Pacific Ocean hold many surprises for visitors. I wanted to compile a list of the most surprising things about Hawaii. This list can help you be better prepared for your trip. It might even help you keep your eyes open for finding some of these amusing quirks. On the mainland we’re used to activities and services moving at a fast pace. In Hawaii, well, some things might move a little slower. As I said in my list of what to avoid on your Hawaii vacation, you might encounter island time in a restaurant, on a tour or on the roads. Rather than get uptight that things aren’t moving as quickly as you’d like, take a deep breath, relax and immerse yourself into this slower pace. Your blood pressure will thank you. A road cousin to island time is the need to drive with Aloha in Hawaii. For the most part, drivers in Hawaii don’t cut you off or honk their horn with impatience. That’s a refreshing change. Instead, they can sometimes be extra generous in allowing merging. Likewise, they might expect you to be generous in allowing them to merge as well. Be prepared for driving in Hawaii by checking out my tips for driving with Aloha. The state fish is the humuhumunukunukuapuaa. There’s a restaurant on Maui with that name. Hawaii loves SPAM – you know, that canned ham-type product. How much do they love SPAM? They consume more cans of SPAM than any other state–even though Hawaii only accounts for 0.42% of the total US population. 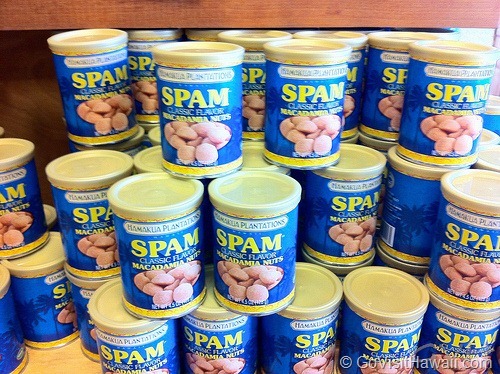 Waikiki hosts an annual SPAM Jam to celebrate Hawaii’s love affair with SPAM. Yes, they love it that much. When you get a loco moco or look over a local restaurant’s menu, you’ll probably be amused to see SPAM. SPAM flavored macadamia nuts? Yep, you’ll find them in Hawaii. What? There’s no ferry system for getting around the Hawaiian Islands? It’s true. There are only two, very small ferry services that run between Maui and Lanai and Maui and Molokai. To get around to all the other Hawaiian islands you must fly. 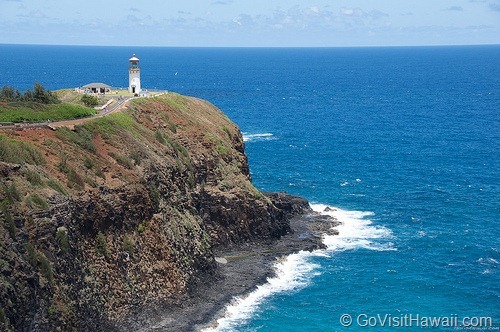 Check out our guide to inter-island travel in Hawaii for tips on how to get from island to island. It’s hard to believe it until you see it for yourself, but the ocean seems especially blue around Hawaii. From my many trips to Hawaii, I’ve never gotten over how beautifully blue the water is there. Hawaii offers wonderfully warm temperatures throughout the year. If you visit Hawaii from North America or Europe during winter months, it’s pleasantly surprising to be able to wear swimsuits without freezing. Even during the coldest month, nighttime lows average 65ºF with an average daily high of 80ºF. These warm temperatures and sunshine keep Hawaii blooming with tropical flowers continually. While we’re on the topic of tropical weather, I should probably mention that folks from places with low humidity are surprised at how humid Hawaii can be. Matt McGee had this to say from his first visit to Maui from his home in Tri-Cities, Washington, “I knew it would be hot, but for some reason I never thought about how humid it would be. It hits you like a brick wall when you get off the airplane. Of course, it’s a tropical island so, in hindsight it makes perfect sense. I just never thought about it in advance.” If there’s a lesson to learn from Matt’s comments, it would be to dress in layers for your flight to Hawaii so that you can peel them away when you land. I live in the South so, the humidity isn’t that noticeable, especially when the tradewinds blow. Though my hair notices the humidity, thus the need for my frizz busters. Did you know that of the 13 distinct climates of the world, Hawaii is home to 11 of them? Isn’t that amazing? On each island, you can go from a volcanic desert-like climate to a rainforest in just minutes. One of my favorite drives through those extremes is this scenic Kohala Coast drive I recommend for the Big Island. 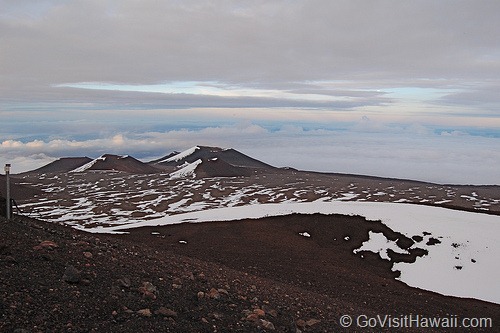 The tallest peaks of Hawaii – Mauna Kea, Mauna Loa and Haleakala – can experience snow in winter months. On one trip to the Big Island, we went from a sunny Kohala Coast beach up to snow covered Mauna Kea in about two hours. Its almost mind boggling to experience going from swimsuit to parka in such a short period of time. I don’t buy milk when I’m in Hawaii, but I’ve heard a gallon can cost close to $7. A twitter friend (@bakabreath) from Oahu recently told me that he got a 1/2 gallon of milk for $2.99 — on sale. You can lessen this sticker shock buy bringing snacks from home. See our post: Food for Thought – Bringing Snacks to Hawaii. Until you get to know the islands, you might think you can see active lava flows on every island. 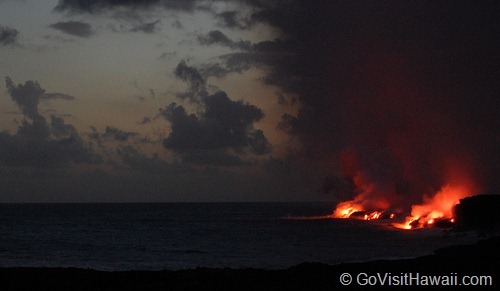 Hawaii is home to the world’s most active volcano, but it’s only on the Big Island. I’m often asked where to find volcanoes in Hawaii. Remnants of volcanoes are essentially everywhere in Hawaii, because the islands were formed by volcanoes. Again, if you want to see volcano activity, you’ve got to go to the Big Island. 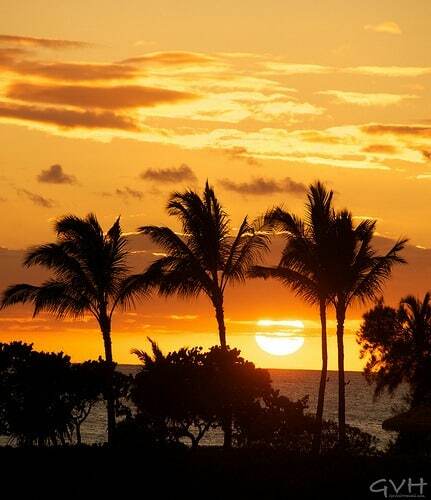 Andy said that one of the first things that surprised him about Hawaii were the early sunset times, particularly in late spring, summer and early fall. Hawaii’s proximity to the equator results in less seasonal daylight extremes than our hometowns that are much higher or lower than the equator. The further from the equator you live — e.g., New Zealand, South Africa, Canada, Norway, Alaska – you’ll notice a bigger difference in summer daylight hours. Of course the opposite is true in winter months, making Hawaii a very favorable vacation destination. 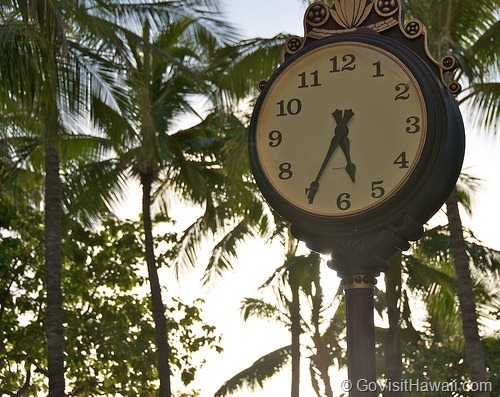 I discuss this fact a bit more in this post: Hawaii daylight hours don’t vary much. In that post I provide an example comparing Chicago daylight and sunset hours to Honolulu’s. On June 21, the longest day of the year, Chicago has nearly two hours of additional daylight and the sunset times vary by nearly 1.25 hours. 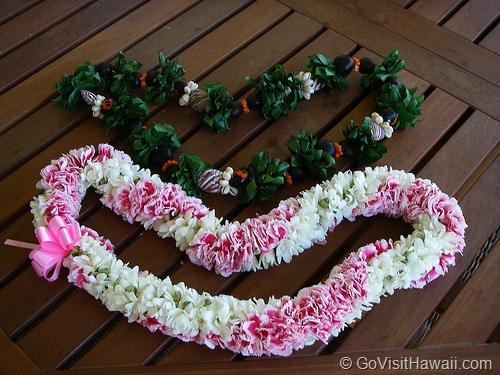 From watching movies set in Hawaii, we had an impression that every visitor received a lei at the airport. Well, unless you’ve pre-arranged an airport lei greeting, there will be no lei for you. I recall arriving in Hawaii for the first time in Maui. I can picture the scene now as I took the escalator down towards baggage claim. At the end of the escalator I noticed some nice greeters holding leis. In my head, I said,”Oh wow, there’s my first lei. It’s so pretty.” As my position on the escalator lowered towards these greeters, I could see that they were holding signs – signs with names on them – and my name wasn’t on them. Lei greetings at Hawaii hotels used to be fairly common, but many cut them out a few years ago when the tourism economy was suffering. Hopefully more hotels will bring them back. Only the high-end Hawaii hotels offer fresh floral lei or nice kukui nut lei greetings. It is a special welcome and one that I treasure at each opportunity. Hawaii is a top spot for astronomy. Just one look into a dark night sky and you’ll soon understand why. You’ll see more stars than you can count — hundreds of them. I highly encourage you to plan stargazing into your Hawaii vacation. When I went to watch sunrise from Haleakala on Maui, I didn’t know I was going to see such a great star show before the sunrise. In addition to the amazing number of stars we could see, we also saw many shooting stars. The water is so blue and inviting, but sometimes dangers lurk in the ocean. It’s important to check conditions and any signage at Hawaii beaches before you even dip your toe in the water. 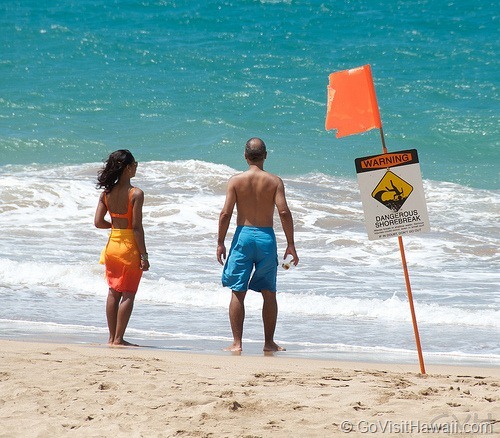 A great online resource to check is Hawaii Beach Safety. Where possible, swim and snorkel where there’s a life guard. A word of advice that you may hear in Hawaii is ‘never turn your back to the ocean’. My mother learned this lesson first hand when she was just walking by a beach in Maui. She turned her back and was suddenly splashed with an unexpected wave. I hope you’ve enjoyed reading through the surprises about visiting Hawaii. Hopefully you’ve also learned some things and are better prepared for your Hawaii vacation. What surprised you most about visiting Hawaii? Thank you once again for pointing out that our visitors need to be careful. The beauty can be deceiving with the ocean. I think many people are surprised by the power and unexpected nature of the waves. When in doubt always ere on the side of caution. 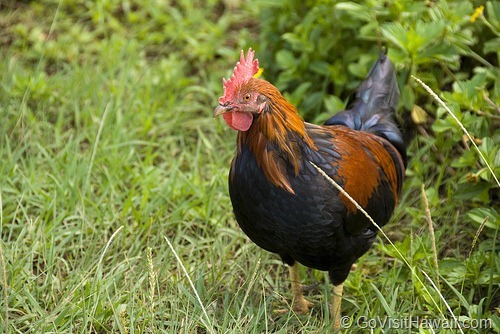 ….and always look out for chickens, they are everywhere and are becoming quite the urbanites. Saw one at a sushi shop in Hawaii Kai and others trying to make their way into the Kailua Safeway. That snow pic on Mauna Loa is really really awesome. I remember reading about 15 years ago in Ski Magazine that there are actually some years where people can actually do light cross-country skiing on the top. There is really that much snow up there sometimes! A visit to Hawaii is definitely in my bucket. The only image of Hawaii we get here in Italy is the TV series “Hawaii Five-O” (announced in a very fake Brit accent, I wonder WHY? ), but the state became our 50th when I was a schoolgirl back in the States and it has always been a big honeymoon location, so I am curious! We get to visit for a third time in February. This time we are going on a seven day cruise that starts in Honolulu with stops in Maui, two on the Big Island (Hilo and Kona) an on Kauai. But, Hawaii isn’t all about tourism. My husband will also be visiting fellow physician-scientists at the University of Hawaii Cancer Center. Aloha. My biggest surprise on my first visit was the lack of lei greeting. I fully expected to get a lei when I got off the plane. On one of our later visits, I arranged for the lei greeting for my wife and I. It’s totally worth it, at least once. Most of the resorts I have stayed at have presented us with leis as soon as we drove up. Some nicer than others, but always a nice touch. Living in California, the sticker shock is not as severe, and we are sometimes surprised at how cheap things at Longs or Safeway are. Even more surprising were prices at the little store on the Fairmont property. Very reasonable prices on snacks, sunscreen, and aloha shirts. Alcohol can be pricey, but if it is wine or champagne that needs to be shipped in temperature-controlled containers, and can’t be en route for too long, it’s understandable.